Home » Blog » Happy Thanksgiving! It’s Thanksgiving week here in United States. So we are suppose to write about being thankful, correct? I mean why wouldn’t you? But this isn’t a chore, even though it is dictated some by the calendar. One thing I (Jim) am learning is to implement more of a structured time to evaluate and reflect personally. We have also been learning through our coaching of business/corporate clients the importance of this reflection time on a daily and weekly basis. 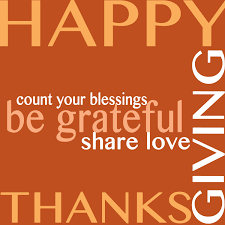 But Thanksgiving gives us opportunity to pause and give thanks. To give thanks requires us to put at least a little thinking and reflection into what we are thankful for. People say, me included, that we shouldn’t just be thankful at Thanksgiving time. But Thanksgiving, and celebrating this time, does help us catch ourselves from our fast pace to reflect and give thanks. That is in part what Thanksgiving is to do for us. So don’t excuse it as we should do it all the time; rather embrace it as a key reminder to take time to reflect and give thanks! Take advantage to not let Thanksgiving simply be a holiday. Embrace it as a time to reflect and give thanks. We all have something or someone to be thankful. Many of us have so much. I am so blessed and thankful. Thankful for all of you and how many of impacted my life. Grateful to God for all the blessings and favor, even in the challenging times of life. There is so much to be thankful that you and I could list, so maybe not here, but take some time to reflect before responding to the question, “For what, or whom, are you thankful?” Then tell it to at least those who are closest to you. You will encourage them while reminding yourself of how much you have to be thankful for. PS- Personal Thanksgiving note: As of this writing our youngest is in route home for Thanksgiving traveling from college a long way from us (It was a last minute kind of decision that we are thrilled happened). We are so excited AND thankful!!! For us…FAMILY!! !